My fondness for Siem Reap started on a Vespa. These colourful chic scooters have fancied me, ever since I saw Audrey Hepburn on it in Roman Holiday. Sadly, I can’t ride two-wheelers to save my life. Riding as a pillion gave me all the opportunity to explore what I otherwise couldn’t have in Siem Reap. As evening falls and darkness sets in, that’s when this city reveals its delectable and bizarre food. 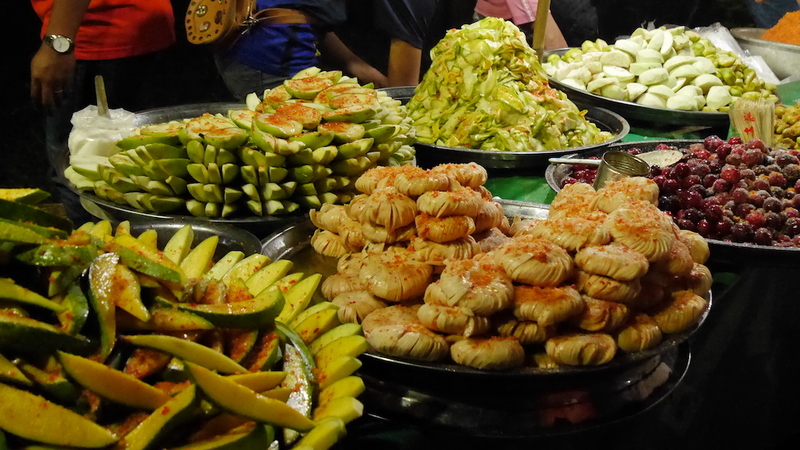 The After Dark Foodie experience by Vespa Adventures befits anyone who is new to South East Asia or is looking for an introduction to the Cambodian street food culture. 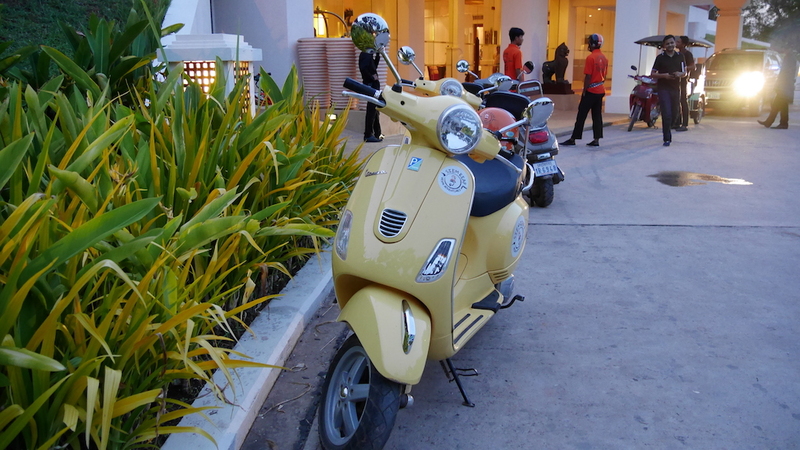 Hop onto my yellow Vespa as I discover the street food in Siem Reap. I would have never guessed that in the middle of the French Quarter, lies a wet market which is the treasure trove of the food supplies that are popular among locals. Known as Psah Chah, this Old Market is next to the famous Pub Street. I like to visit these local markets as they are the great starting points to acquaint yourself with the food that you’ve never seen before, for instance, I saw a shop with a tub of red ants which were collected and soaked in water and were ready to be sold. 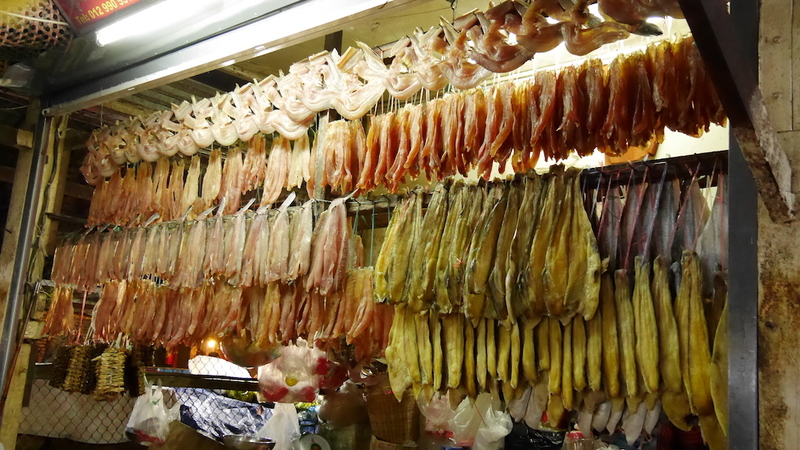 The meat of crocodile, water snake, buffalo and others being sold in the form of jerky. On our stylish Vespas, we breezed through the traffic of Siem Reap to reach the night street market where only locals could be spotted. Not to be confused with the Night market near city centre which mainly caters to tourists. When I saw a bevy of carts selling unusual food, I knew it was going to be a tough time for me. The first stopover was relatively easier, a fruit shop that sold varieties of South East Asian fruits, most of which I had seen before in Singapore but tried only a few. If this is your first time in this region, you should try Durian and soon you’ll know why it is not allowed on public buses and trains :-). I have been gallivanting across South East Asia for quite some time now, and I like how they play with the flavours using fruits. Here in Cambodia, I found fruits either laced with palm sugar or with a sprinkle of chilli. 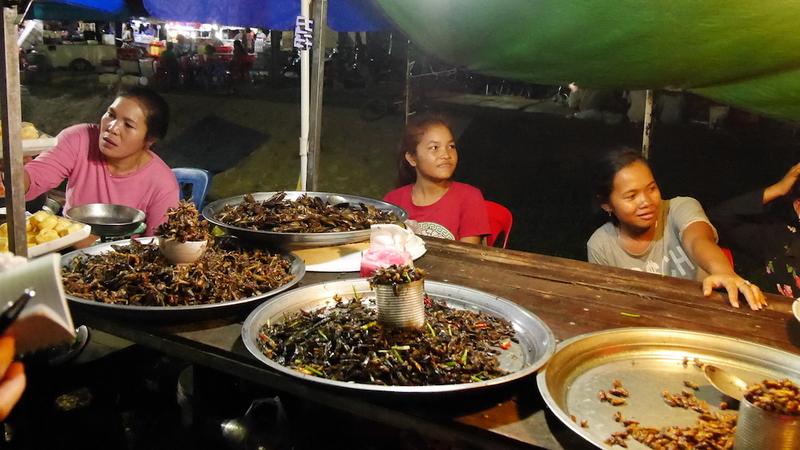 Further in the menu was what I was most excited about – a myriad of fried insects. I tried a cricket which was crunchy but lacked any distinct flavour of its own. I soon realise I don’t have the heart to try everything, but my husband was on a roll and tried water beetle, fried tadpole which he said tasted like KFC chicken, soft cocoon and I’m cringing as I think of it. The young girls were amused by our inability to eat what is common to them. 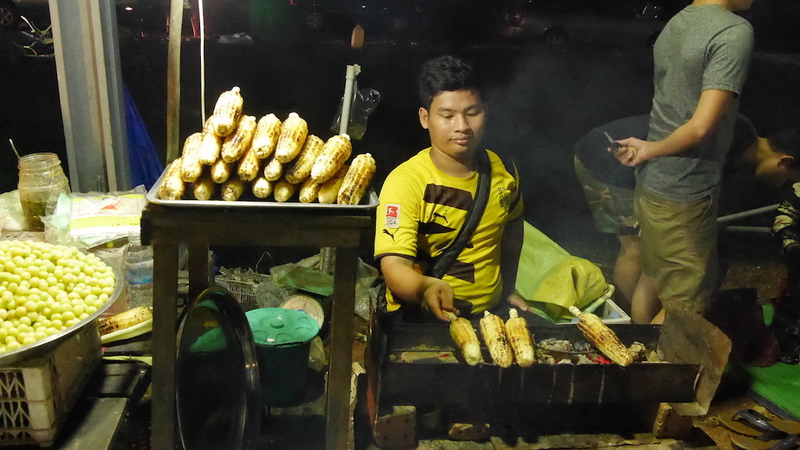 My personal favourite was Pot Ang – a charred corn on the cob brushed with lightly sweet coconut syrup and green onions – a perfect evening snack for me. 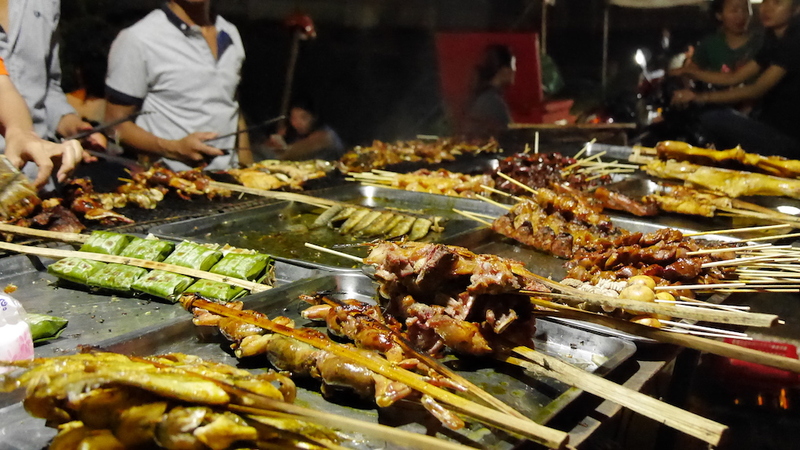 Despite being a hot country, Cambodians love barbequed meat of all kinds. It was the first time in my life I made bold food choices, all at once – frog stuffed with pork (which was not too bad), water snake, water buffalo, crocodile jerky and some quail. Ha! Can you beat this? Once again, we hopped on our Vespas and went ahead to make our next stop. 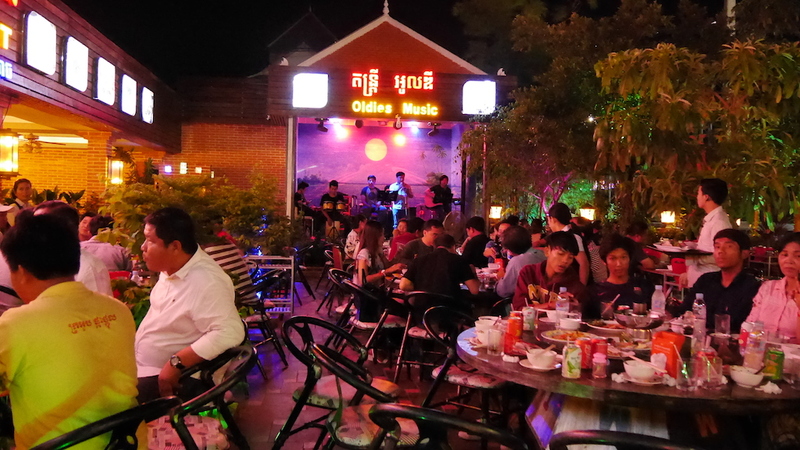 By evening, the famous Pub Street of Siem Reap gets inundated by tourists, however, we were heading to the back streets where locals eat out in local beer gardens. 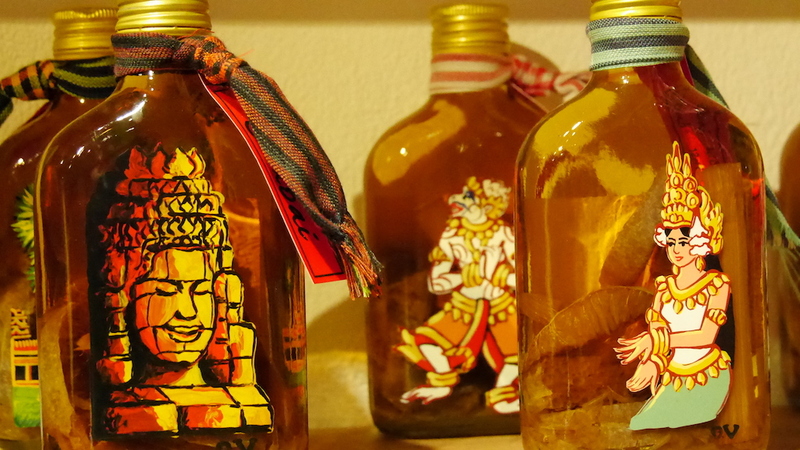 Cambodian lager paired with local snacks and a live Khmer music band made it all the better. It was not over yet. Our last stop was at Sombai, a local winery that produces speciality wines by infusing unique flavours into distilled rice wine. Some of their wines are Galangal with Tamarind, Star Anise with Coffee, Pineapple with Coconut, Ginger and red chilli and an exclusive Umami wine had cherry tomato and black pepper. They say their bestseller wine is lemon with lemongrass, but my favourite was the Banana with Cinnamon which had a Christmassy feel to it. Take a moment to look at the remarkable oil painting on the wine bottles done by local people who have hearing and speech loss. I was so tempted to buy an empty bottle just for the incredible artwork. 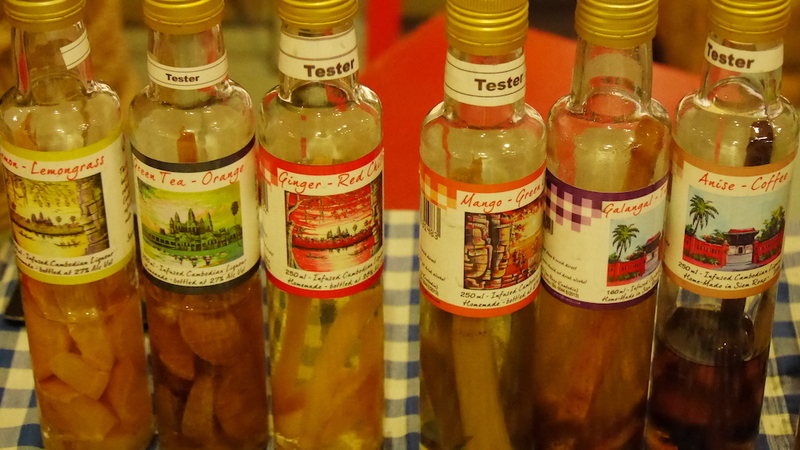 I was already woozy after free tasting of at least ten flavours but didn’t mind digging into some Cambodian desserts. 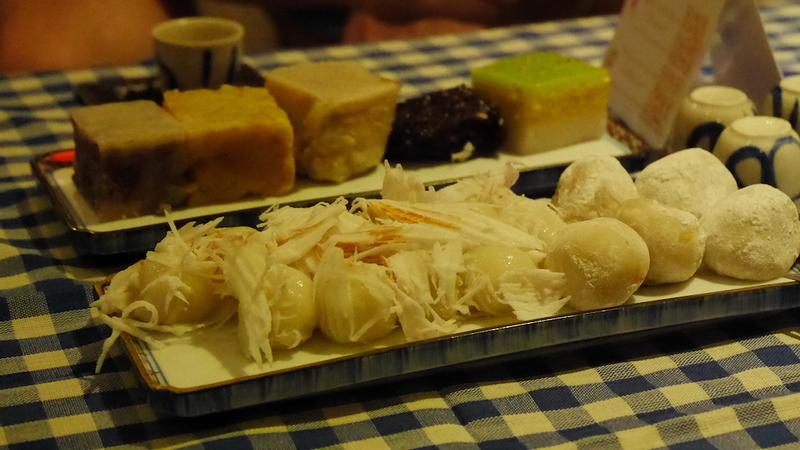 While others in our small group had enough of food, I couldn’t resist the mouth-watering plate of assorted cakes – sticky rice cake with coconut and palm sugar, banana cake with coconut milk, bean cake and black sticky rice cake. With this, my short love affair with Vespa also ended. I had a wonderful evening scootering around Siem Reap. I bade goodbye to my friendly guide who gave me a bottle of wine as a token of remembrance. Yay!! Disclaimer: I was a guest of Vespa Adventures. Check out their website for other awesome tours across South East Asia. The opinions expressed in this blog post are solely my own and are not endorsed in any manner.